The presence of former Real Madrid players Raúl, Klaas-Jan Huntelaar and Christoph Metzelder on the Schalke side will “motivate” Valencia when the two teams face off in the first leg of their Champions League round of 16 tie tonight according to home coach Unai Emery. His Schalke counterpart Felix Magath, meanwhile, is hoping to see his side score at the Mestalla. It’s such a beautiful, attractive and exciting game to play in that we are not thinking about a result right now. The favourites for the Champions League are Real Madrid and Barcelona – after that there isn’t much difference and Schalke 04 and Valencia are dead level. We believe in our qualities but respect our opponents’ too – Schalke are very competitive. There are several ex-Madrid players at Schalke and it shows you their quality; those players make the difference. This should be something that motivates us. The key point of this round is intelligence over 180 minutes, and being able to overcome individual and collective problems. It is a very important game. I came to this club to take them to where they want to be and there is a great opportunity for growth. We’re facing a very strong team who are third in the Spanish league and have done a great job in the Champions League, scoring a lot of goals. Valencia as a team are similar to Lyon but stronger in attack. We are hoping to get a goal to give ourselves a better chance in the second leg. The team are improving because they’re getting to know each other and the way we work. In the Champions League we’ve been doing better because we’ve had many new, experienced players who needed time to get used to the Bundesliga. I was expecting a reception like this because of the sense of expectation Raúl brings. Now I just hope he can score tomorrow. 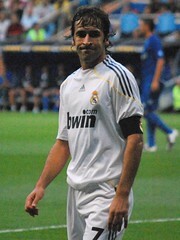 Raúl is a great player in football terms and in human terms is an example to follow both on and off the field. Vicente Rodríguez was an unused substitute at the weekend after recovering from a right thigh problem. Juan Mata has an ankle problem though Emery is hopeful he can play, while David Albelda, still nursing a knee injury, is suspended. No1 César Sánchez has been restricted to four appearances since 21 October because of hamstring, calf and knee ligament injuries but Emery says he is “ready”. Defender Kyriakos Papadopoulos did not travel after pulling a muscle in Schalke’s last training session before departure while Christoph Moritz has a knee problem and is also missing. Valencia have collected 23 out of a possible 27 points in the Liga since ending their group stage campaign at Old Trafford, helped by four decisive late goals. Six wins and a draw represents Valencia’s best start to a calendar year in the Liga. Their previous high came in 1949/50, a season they ended in third place. Jefferson Farfán’s goal at the weekend was only the second Felix Magath’s team have scored in five Bundesliga games this year. Still Schalke have won eight of their last 11 games and are five matches unbeaten away from home, winning four, since a 5-0 loss to 1. FC Kaiserslautern on 27 November. This will be a tight contest over the two-legs as both teams are evenly matched. I expect Valencia to win the first leg at home, but Schalke to get that all important away goal to set-up a great second leg in three weeks.